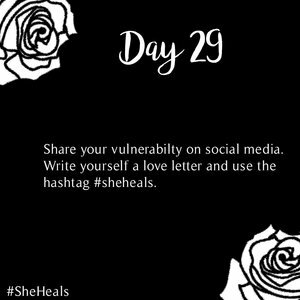 As we approach the end of the #SheHeals challenge, I have come to see myself in a different light and with that in mind, I can finally write myself a letter of some hard truths about my vulnerability. I’ve been through a lot and from reading other people’s #SheHeals experiences, I realise now that we all have our own demons that we need to part with. Having grown up in a country that hasn’t fully grasped the concept of emotional abuse and mental health makes being vulnerable a bit tricky due to the fear of retribution or unnecessary trolling but here goes nothing. For a very talkative woman you censor yourself too damn much. Not really sure where along the line someone spoke over you or when they didn’t give you the opportunity to learn how to communicate openly and honestly. Your opinions are valid. You have every right to be wrong. You are allowed to also voice your ideas and concerns. No, whatever you say won’t make you look stupid. You have never been able to stand up for yourself in times of conflict. You allow the person to communicate their grievances and never voice your concerns. Instead you just let it fester until you breed resentment towards that person. You cower away and re-live the experience over and over in your head which just makes you crazy. Learn to communicate your side of things. When you suppress it, it usually comes out all wrong and at the wrong time. Deal with it right there and then to avoid unnecessary emotional turmoil. Most people don’t realise how shy you are. It’s always funny to watch. You start blabbering and chatting just to fill the silence. You tell a lot of jokes to pass the time and to avoid people getting to know the real you. Someone can sit with you for hours and still walk away knowing very little about you but very much entertained. It’s a gift and a curse. You’ve watched enough the confidence videos tutorials on YouTube to look the part of a confident young woman. It’s so strange that compliments evoke the same reaction in you as insults. Why are you unable to receive compliments? Who made you believe that you are inadequate and unable to do anything right? Why do compliments make you so uncomfortable that you’d rather be invisible? Is it so hard to believe that you might actually be good at what you do?